Last week I met with a local professional trader who specialized in trading only Canadian stocks. While he mainly trades the 75 large cap stocks on the TSX which have the liquidity requirements he needs, he also trade penny stocks on occasion. 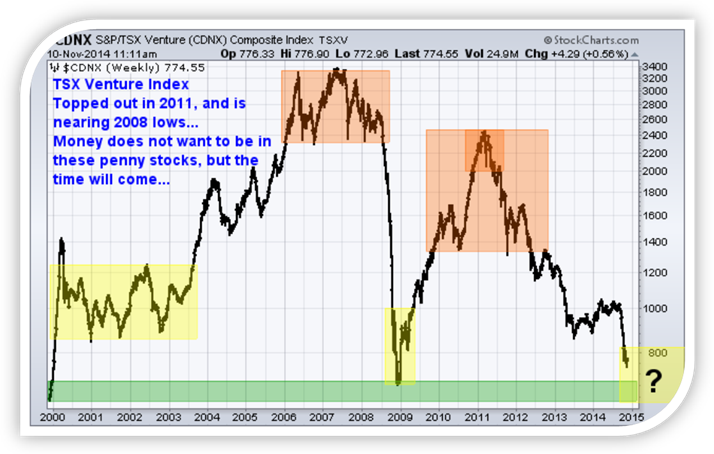 When he pulled up the TSX Venture index and reviewed our outlooks, we both came to a similar conclusion on what to expect moving forward. We all know what happens to boats when the tide goes down… This index shows very clearly why most penny stocks have been losing value the last three years. Money has and continues to flow out of these equities and if fighting this major trend it will likely cause you frustration and financial pain. Knowing that most of the largest moves based on percent happen during the last 10% of the trend, we must expect micro-cap stock prices will be extremely volatile for many months. Another 30-60% hair cut could still be ahead. The TSX Composite is heavily resource-weighted and this market has lagged its counterparts around the world in the last year. This year the Canadian index played catch-up as seen in the chart below and was the strongest index in 2014 until this recent correction. These equities may hold up well when the US market starts to top/correct. 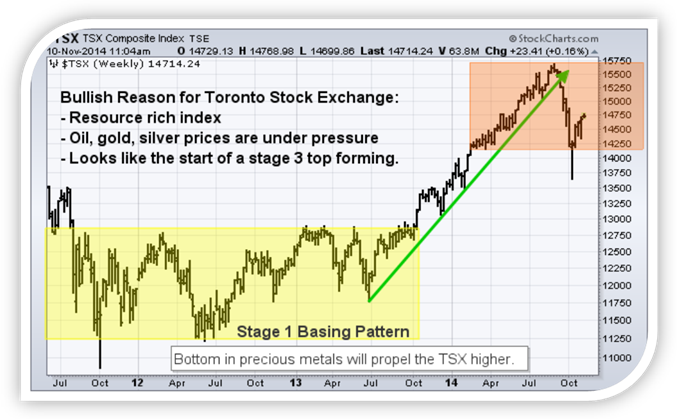 This is because the TSX’s is heavily weighted in late-cycle stocks (resources), it’s not unusual for the Canadian market to lag in the early stages of a bull market in the USA, catch up in the late stages, and then outperform toward the end. In short, I think 2015 will be the start of a new micro-cap stock bull market. Sure it could take more than a year to base and start to rally, but the time will come when ridiculous amounts of money will be made in this corner of the market. We all hear stories about how a couple thousand dollars in a particular stock would now be worth $250,000, $1,000,000 etc… well times like that will happen again. But we must wait and watch for this perfect storm to unfold. Starting in Dec/Jan I will start sharing my top 12 micro gold and silver stocks along with my trades/positions in them as I take them.